Cycle Park bike racks communicate to cyclists that bike parking is available, with a laser-cut bike parking symbol that promotes “bikes belong here”. Cycle Park bike racks offer the security of two-point locking, protecting both the bike wheel and frame. Each rack accommodates two bicycles in an sturdy, upright fashion that maintains clear access aisles for pedestrian traffic. Ideal for streetscapes, campuses, or municipal sites for short term use. Great for bike rooms, bike stations or parking garages for covered or indoor bike parking. 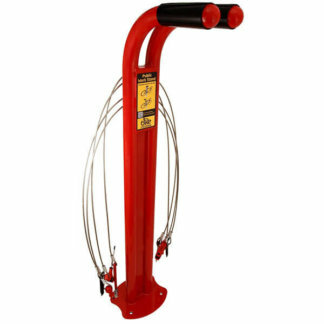 This rack will withstand the test of urban environments for years to come, with our quality materials and finishes that CycleSafe products are known for. Standard heavy gauge Sch. 40 steel pipe with zinc primer TGIC powder coat finish. Many standard or custom TGIC finishes are available. 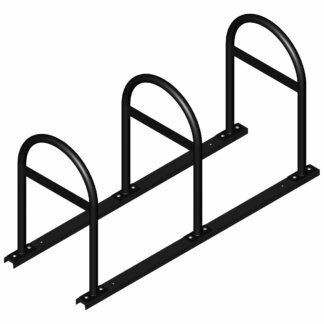 These commercial bike racks are available in Surface Mount, In Ground or Rail Mount options for portability. Specify Cycle Park Racks to let your community know that bikes belong here.